Russian diplomats accused of health care fraud leave U.S. Experts believe that neither Moscow nor Washington is interested in creating a scandal over the alleged insurance fraud. Most of the 49 Russian diplomats and their family members accused of illegally receiving $1.5 million in health insurance benefits in the United States have returned already to Russia, investigators in the case said. Most of the defendants have already left the U.S., and only 11 of them remain: five work in the Russian mission to the United Nations, one in the Russian embassy in Washington, and the rest are spouses of diplomats. Kommersant reported that they will also return to Russia in the near future. Overall, criminal proceedings were initiated against 49 Russians – 25 former and current employees of the consulate general, the trade mission of the Russian Federation, and the permanent mission to the United Nations, as well as their families. The Russian diplomats and family members are accused of providing falsified evidence of income that significantly understated their income in order to receive medical benefits in the U.S. For example, Vitaly Sagura, an employee of the Russian consulate general in New York, provided social services with documents reporting an annual income of only $29,000. These documents, according to investigators, were signed by representatives of the diplomatic mission. According to the investigation, the diplomat's salary was actually $5,160 per month. 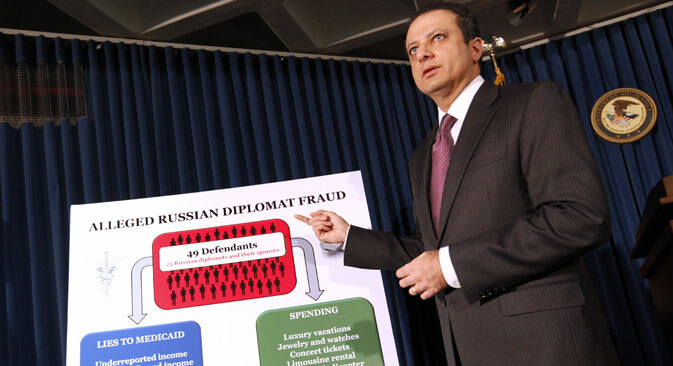 But in the end, investigators said he received $37,000 in benefits from the U.S.
U.S. law enforcement agencies said they were tipped off when they identified unusually large number of applications for medical benefits from Russian diplomatic institutions in New York. All of the applications were for assistance provided to the needy in the U.S. during pregnancy, childbirth, and childcare. According to the indictment, from 2004 to 2013, 63 children were born to Russian diplomats, and the parents of 58 of them (or 92 percent) requested and received financial assistance under Medicaid. This program provides medical assistance and financial incentives to residents of the country with incomes less than $3,052 per family, per month. Russian diplomatic sources say the accusations are politically motivated or even a provocation. One Russian diplomatic source said it is usual international practice for the authorities to go to the diplomatic mission directly with all questions regarding foreign diplomats. In some cases the problems are solved after some clarification, in others the necessary steps are taken. "All problematic issues are solved at the diplomatic level. But to watch them break the law for nine years, as they write, and not to raise any questions, and then suddenly come with an accusation – this is politics," Kommersant quoted the source as saying. "They wanted to stage a show, and they did it. To investigate diplomats is a violation of the Vienna Convention, to collect information without checking it legally and in a publically accessible way is stepping beyond the legal framework." Viktor Kremenyuk, the assistant director of the Institute for U.S. and Canadian Studies, told Dozhd TV station that he did not think this was done specifically against Russia. “A problem came up that the Russian side reacted to in an elevated and offended tone,” he said. “First, there was a lot of confusion because it was such a large group of diplomats. Second, among these people, there are people with influence or children of people with influence, so they tried to protect them." Meanwhile, experts point out that the main accusations against the Russians were made by New York prosecutor Preet Bharara, who Russia has banned from entering the country in what many said was retaliation for the Magnitksy act. The U.S. act was adopted in April and bans 18 Russians from entering the U.S. because of alleged human rights violations. Bharara is listed by Moscow as a "person involved in violating the human rights and freedoms of Russian citizens abroad" for his role in extraditing Viktor Bout and Konstantin Yaroshenko to the U.S. to face charges of arms smuggling. "The time chosen for the scandal, and the fact that it was initiated by a group that acted against Bout and Yaroshenko are significant," said Yuri Rogulev, the director of the Franklin Roosevelt U.S. Research Foundation at Moscow State University. "The investigation was conducted for several years, however Russia was informed only now. This is due to the general state of Russian-American relations at this stage." However, most observers believe that neither Russia nor the U.S. is interested in creating a scandal. U.S. State Department. Spokesperson Marie Harf, acknowledging that foreign diplomats can receive medical assistance from the federal government. "We do not think it should affect our relationship with Russia. The relationship is much deeper, broader, and more complicated than that," she said. Based on materials from Kommersant and Dozhdj TV channel.